There is a solution to the problem of the Confederate battle flag hanging over various Southern state capitols, a solution so simple and pure that I cannot understand why no one seems to have thought of it before now. The problem is that the battle flag, which blazons the Mississippi state flag, and until recently was part of the Georgia state flag and was hung atop the South Carolina state house along with its state flag, is seen by a sizable portion of the Southern population as a symbol of slavery and White supremacy. They do not want it hanging over their state houses. They take deep and honestly earned offense at the idea. Yet another faction declares that they are not honoring slavery or Jim Crow with the flag, but the memory of their dear, departed ancestors, who fought so valiantly for the noble lost cause. Their defense of the flag seems not a little disingenuous, considering that the flag in question wasn’t added to the state flags until the strife-torn Civil Rights era, and then as a symbol of defiant segregation. The Georgia flag dates from 1956, and the South Carolina practice of flying the flag began in 1962. Surely the heritage they celebrate has to include the African-American population that was essential to the economy and culture the flag partisans honor. 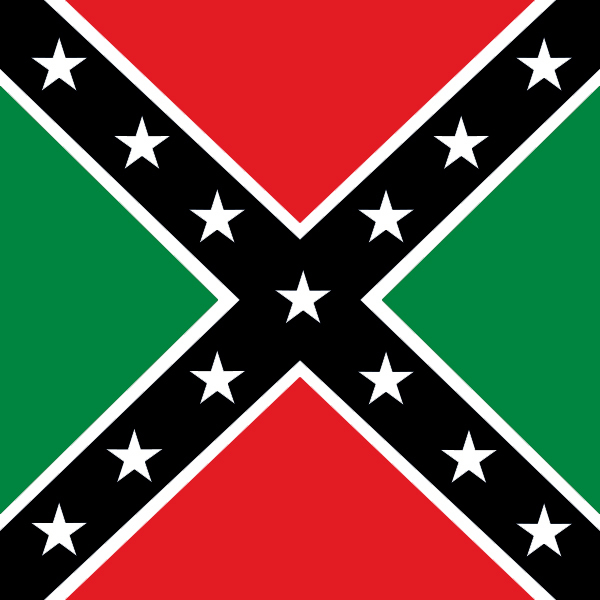 So, allow the flag to be displayed, but portray it, instead of its normal colors of red, white and blue, the “soulful colors” of green, black and red. The vexillological problem in the design is that these three colors don’t provide a lot of contrast from light to dark. And since green and red are complimentary colors, if they are placed side by side, they jar the eye, so, my design solution is to spread them out, with white borders between, separating the colors.